Will You Still Need Me, Will You Still Feed Me…? Sixty-three years. Sixty –three years of, “Yes, Dear,” and “No, Dear,” and “I’m sorry,” and “I love you.” Sixty-three years of travel, and adventure, and family. Sixty-three years of couplehood, of shared friends, of individual pursuits. Sixty-three years of learning the steps that make up the dance of a successful marriage. To witness first hand how that dance evolves over time is truly a blessing. Yesterday, I traveled cross-country with my parents to help them get to their summer home on Torch Lake, in Michigan. 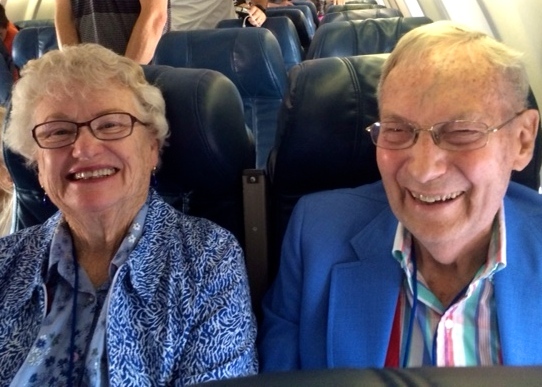 They no longer travel alone, despite 50+ years of traveling around the world, to places near and far. My sister had made all of the arrangements, which were quite involved, in advance. Wheelchair service had to be set up, in advance, and all paperwork and reservations were printed and tucked carefully into my bag by that sister. Mom and Dad were ready to go when we arrived to pick them up. Both had lanyards around their necks with their community IDs and their driver’s licenses tucked neatly inside clear plastic badge holders. Their luggage weighed more than they did. Combined. And Dad’s wheelchair, for use at the lake house, was meticulously wrapped for optimum protection in yards and yards of bubble wrap that popped startlingly whenever it was moved. All of the planets were clearly aligned in our favor, as we were able to secure curbside check in for those poor bags, stuffed so far beyond their capacity, that they were held together with huge, thick straps advertising Diablo Travel or some such agency. The increasingly frazzled TSA agent squatted down in front of Mom and began lifting her pant leg. “This, Ma’am. What is this? “That’s fine, Ma’am,” the TSA agent said, as she shuffled Mom off to the side. Why didn’t you just tell her about the money belt, Mom?” I asked when she finally was able to join me. “Well, she didn’t ask me about that!” she replied incredulously. Eventually, we reached our gate and were able to board the plane. We travelled first class (thank you, Kathy for making the arrangements) and they settled in, side by side. I sat across the aisle. Watching them, I could see a reflection of who they used to be, bold adventurers, off to Malawi or Zimbabwe, Geneva, or Rome. 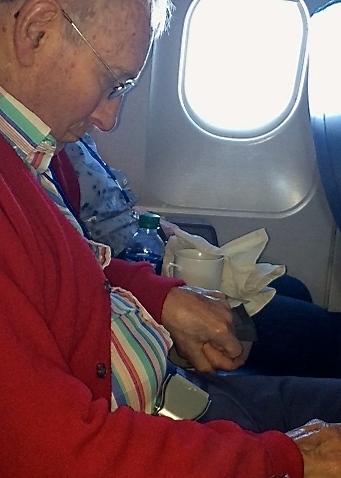 Despite the headache of early departure, of wheelchair deliveries, of TSA hassles, they were on board and in their element, seated together, dozing, and tenderly holding hands, perhaps waltzing in their dreams. This made me tear up Sue. What a beautiful thing to be able to witness. And even more beautiful that through the ups and downs and trying times of life they have stuck together for 63 years! And raised amazingly kind and talented children I might add. Love you! Oh what a difference a year makes. Today marks what would have been my parents’ 64th wedding anniversary. Sadly, Dad died in February. He is here in spirit and we are loving Mom a little bit extra today.